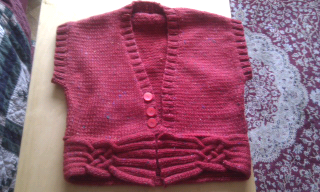 I am getting pretty fed up of another too-short garment. Looks fab but going to have to crochet an inch or two onto the length. But what stitch? DH out tonight so it will just me, my almost finished project and some heaving-bosomed drama on the box. Perhaps a cheeky glass of perry too. Picked out some buttons in the village craft shop. The ladies agreed that stocking stitch was just wrong for bunting. It would always roll up. They are running a beginners knit and crochet class over two evening sessions with plans for more advanced. Monday evenings will suit me. These three ladies are a font of all knitting and crochet knowledge. Couldn't help showing off a photo of my union jack bunting - it looks quite respectable from a distance! Can't wait to quiz them on thinks from suitable stitches, yarn choice and substituting yarn. They nodded very knowledgeably when I said these were subjects I need advice on.